Werner Herzog’s documentaries are characterized by the director’s philosophical and winding narration, gently inserting personal observations into diverse explorations of a man foolishly living among wild bears, ancient cave paintings, or death row inmates. But when that narration technique is removed from serious topics and instead applied to the lives of hopelessly lazy southern California bros, the trumped-up seriousness only inspires comedy. That’s the thinking behind a new video from 5 Second Films that depicts the grotesque squalor of a group of male roommates in Silverlake, California, locked in a standoff to see who will give in and clean the house first. There’s the guy who wakes up and leaves before anybody notices he’s awake, the roommate who only moves to the couch to take bong rips all day, and the guy who cleaned the kitchen the last time and thus refuses to be that guy again. 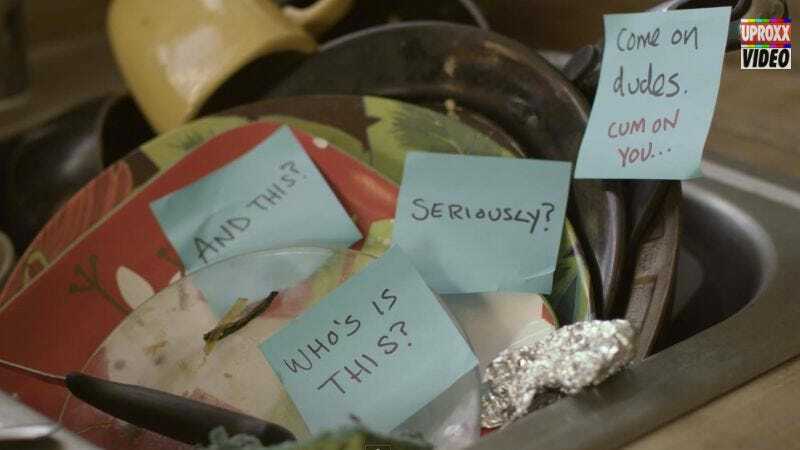 The obligatory passive-aggressive Post-It note battle raging across the filth is fantastic, and the faux-Herzog narration runs throughout the video offering attempts at deep insight into the lives of white dudes in arrested development.